Play with £60+ 20 SURE WIN SPINS! Come join the party at Gossip Bingo! 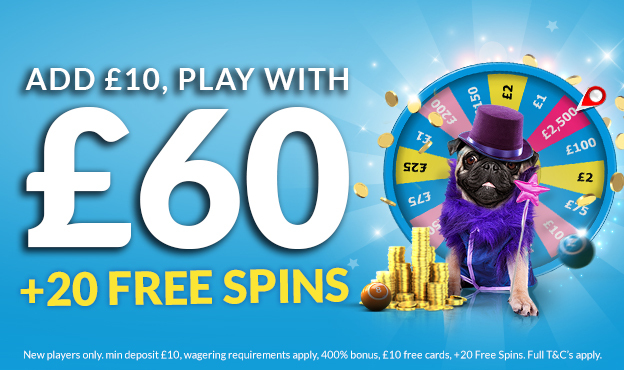 First sign up and you'll get £10 worth of cards to the £777 Jackpot game, then make your first deposit of £10 or more for a huge 200% Bingo Bonus, 200% Games Bonus and 20 Free Spins!!! That gives you £60 to play with today! Plus you’ll also get a free spin on our fab Gossip Bingo wheel for a chance to win up to £2,500 extra! 1 free Bonus Wheel spin to win up to £2,500. The 20 Free Spins will be granted for slot games irrespective of the deposit amount. Players have to log into their account in order to activate the free spins. Winnings from free spins are credited to your account in Games Bonus. 200% Bingo Bonus; wagering requirement of X3 (deposit amount + bonus amount) prior to withdrawal. 200% Slots Bonus; wWagering requirement of X50 (deposit amount + bonus amount) prior to withdrawal. Maximum bonus is £80: £40 Bingo Bonus funds and £40 Slots Bonus funds. Last Updated on 9th April 2017.